The face velocity is measured using a heated thermal resistor and based on the resistance change principle; it is a non-contact measurement and hence not subject to wear. The face velocity sensor is placed in a bypass opening where it measures the airflow. This airflow is equal to the face velocity of all sashes of the fume cupboard. The face velocity transducer can hence be used for both vertical and horizontal sashes. Since cascade control applies, the face velocity is kept constant based on the volume flow rate, which lies between the set minimum and maximum volume flow rates. Opening the sash leads to a decrease of the face velocity. The fume cupboard controller raises the volume flow. Sufficient air transfer from the room to the fume cupboard is ensured (and work safety is maintained). 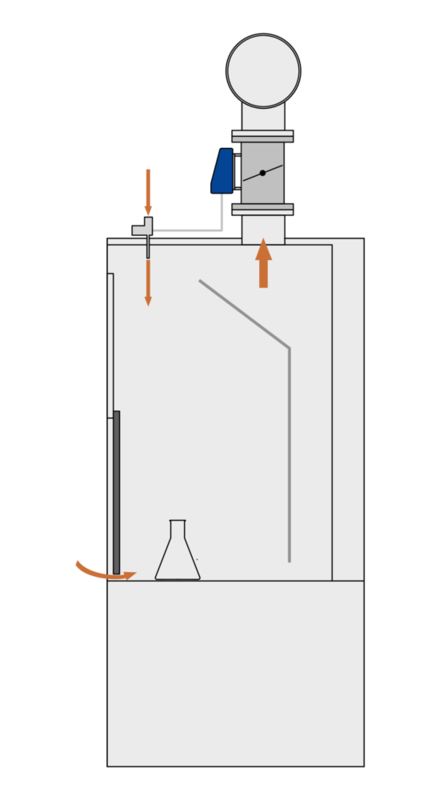 Closing the fume cupboard leads to a decrease of the volume flow such that the face velocity is kept constant. The minimum volume flow ensures sufficient ventilation of the fume cupboard. The face velocity is monitored. If the face velocity is above or below a certain limit, an alarm is emitted on the control panel. Limits and the type of alarm can be configured. Electronic transducer for the LABCONTROL system, used to measure the face velocity on fume cupboards. Suitable for fume cupboards with vertical and horizontal sashes. Non-contact measurement, not subject to wear. A 2 – 10 V DC voltage signal that is proportional to the face velocity is emitted. 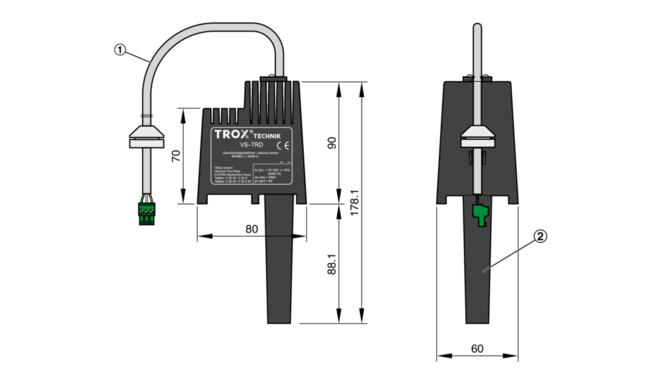 If the sensor is connected to a fume cupboard controller, the volume flow is controlled based on demand. 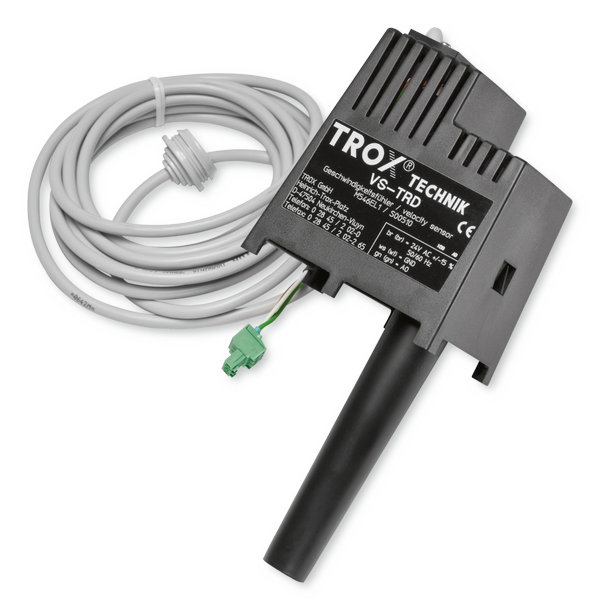 If the transducer is connected to a monitoring system, an alarm is emitted in case the face velocity is higher or lower than the set maximum and minimum values. Simple mounting on the fume cupboard dome. Any attachments are to be defined with the order code of the VAV terminal unit.